Instead of visiting a local doughnut shop, break out the mixing bowl and rolling pin and prepare a batch of homemade doughnuts. These wonderfully sweet and totally addicting breakfast treats can be within reach of any home baker. What is your favorite doughnut to make? Let us know in the comments section below. Homemade doughnuts are a versatile homemade treat. Roll them in powdered sugar or glaze them with chocolate, the possibilities for this fried treat are endless. Samoa doughnuts are a super delicious dessert. These sweet treats are baked not fried so you don't have to feel as guilty for indulging. Inspired by the favorite Girl Scout cookie, these doughnuts are coated in a caramel coconut sauce and dipped into chocolate. Also like the cookie, you won't be able to have just one. Surprise Dad this Father's Day with breakfast in bed. Freshly made beer doughnuts are an irresistible treat that no one will be able to turn down. They are baked instead of fried which yields a light (and not greasy) doughnuts. Once out of the oven, they simply dusted with powdered sugar. You can also dip them in glaze. If you are not into cake or cupcakes to celebrate your birthday, try these amazing birthday cake doughnuts. These buttermilk doughnuts are baked not fried so you'll save a few calories (but who is counting on their birthday anyway?). Each doughnut is studded with colorful sprinkles, glazed, and topped with even more sprinkles. Breakfast cereal doughnuts combines two breakfast favorites into one delicious treat. 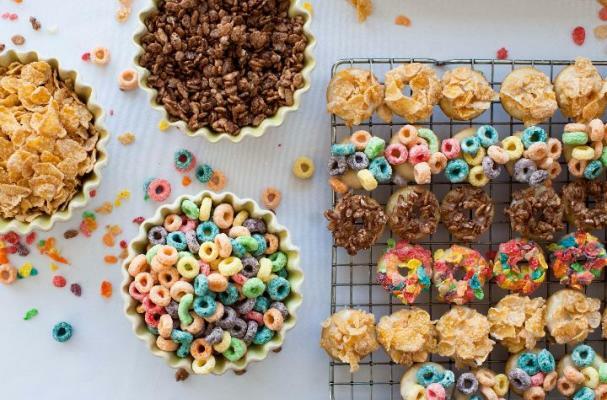 Homemade baked sour cream doughnuts are topped with a tangy glaze and a variety of sugary cereals. You can sprinkle on Fruit Loops, Frosted Flakes, Fruity Pebbles, Cocoa Krispies and the like. Your kids will go bananas for these doughnuts.